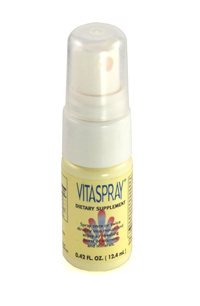 Each spray of VitaSpray provides more than the recommended daily value of Vitamin B-12 with a proprietary blend of herbal extracts and minerals. Water Soluble B-12 is important in the maintenance of optimum health, metabolism, the formation of red blood cells, and the central nervous system. Be the first to review “VITASPRAY” Click here to cancel reply.